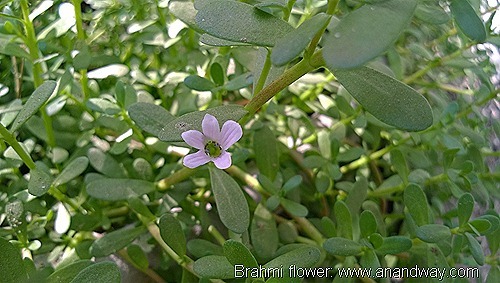 Brahmi is very easy to grow at home in India. The Brahmi stem strikes roots if it finds congenial growing conditions, that is, lots of water and a little shade. Naturally, it is found growing alongside streams. In the rainy season, tiny mauvish-white Brahmi flowers blossom. Brahmi plant is available with some local nurseries and CIMAP in Lucknow. If you wish to order online, contact us at anandway.com. Eaten fresh, Brahmi leaves are a little bitter. You can blend them with water and misri in a blender, strain and serve as a morning drink. Brahmi is good for the nervous system. Do ask your Ayurvedic Doctor for a pulse diagnosis to know which herbs are good for you.